In stock 20 pcs. Also available in our walk-in store. 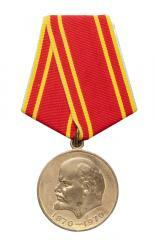 A commemorative medal, celebrating the 100th birthday of Vladimir Lenin (1870-1970). 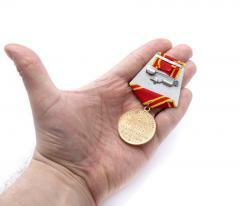 A great conversation starter for the modern human; everyone recognizes the celebrity pictured in the medal. Created on 5.11.1969. They made these in ridiculous numbers, about 9 million, so get yours now! Real deal Soviet militaria, no-one would bother copying these.